Engineering — Precision Aerospace Corp.
PAC's engineering department continues to advance its engineering capabilities and maintain its industry leading position. 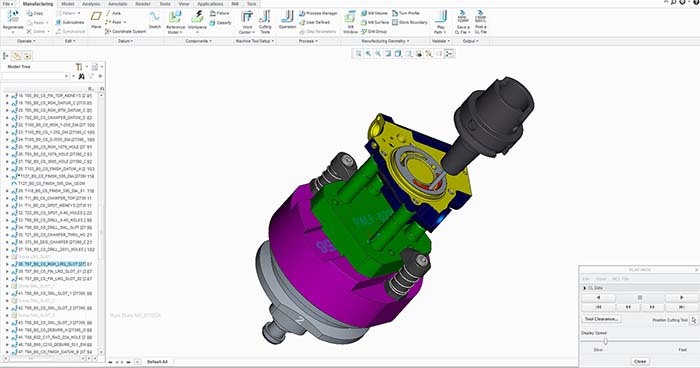 Continuing investments in computer aided design, such as the latest version of the Solidworks® 3D solid modeling software, and off-line CNC programing, allow us to create the most efficient, productive, and robust manufacturing process in the industry. We have over a century's worth of design and engineering expertise going into every new product we manufacture. Our engineering group is also the most creative and agile in the industry. We are constantly adapting the latest manufacturing techniques and methods to build the most economical and efficient process on the market. Our creativity, experience, and agility allow us to quickly respond to continuously changing needs. From minor modifications to entire new part designs, we can meet the unique demands of our individual customers and be the “Partner of Choice” for your precision contract machining. Each new product produced by PAC is assigned to a Project Engineer to manage. During the kick off meeting, the project team is assigned with a cross functional team represented by Engineering, Design and Programing, Quality and Operations. This is the formal kick off of our Advanced Product Quality Planning for each part. All tasks are assigned and tracked through our Engineering SharePoint site with monthly report outs of each project to management. Every part is built from scratch as a solid model using the customers print. Each model is "cut" away to mimic the process of machining the part with each operation grouped together and operational drawings being created from the model. We currently utilize PTC Creo and SOLIDWORKS for our CAD software. With this we can handle all of the file extensions our customers use (.stp, .prt, .stl, .dwg, etc.). Each operation is CNC programed using the right software for the application, be that 3, 4 or 5-axis milling, turn, or Swiss machining. Every program is verified off line using VERICUT to validate that tool paths do not violate the work piece or leave excess stock. All of the work holding is modeled and used during the CNC programing tasks. This insures that there will be no crashes in the machine tool during the prove out.